Please Read This First Before Placing an Order! 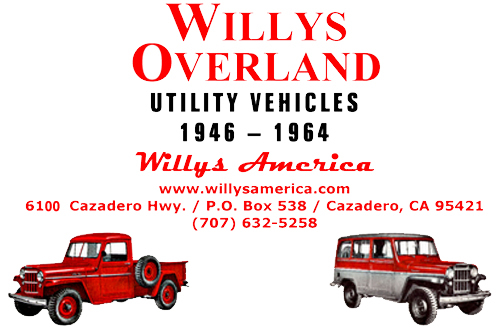 Even if you think you know the year of your Willys, confirm it! Many Willys were registered by the YEAR OF SALE, not by the YEAR OF MANUFACTURE. A vehicle may have sat in a dealer's inventory for a number of years until it was sold. The VIN number on the title may be a MOTOR number not the VIN number, especially on pre-1954 vehicles. Inadvertently, the owner of more than one Willys may have switched titles when selling the vehicle to another owner. The factory would often issue a Service Bulletin advising dealers to re-stamp the VIN Plate to a new year if a model still remained in the dealer's inventory. This was a common practice. Be sure to read the previous year's Model description as well. Please select a category from the left navigation to begin your shopping experience.